I enjoy a challenge and learning something new, and have created a few knitting and crochet projects over the last twelve months. I see such inspirational photographs on my social media feeds, I was quite taken with all the Sky Blankets I came across a few months ago. But did not come across this form of knitting challenge until it was too late. I long to create something that I can admire with pride and enjoy year after year. What is a Sky Blanket? A Sky Blanket is a knitting or crochet challenge that lasts a year, each day you knit a square matching the colour of the sky at mid day. You will end up with a selection of colours ranging from dark grey, white to bright blue. At the end of the year all the squares are sewn together to create one unique blanket or throw. I like the idea of creating an alternative sky blanket, a Garden Blanket. Whereby I use a colour from my garden to knit that day to create a unique blanket. A blend of greens, yellows, and the colours of different flowers blooming in the year. I know you are thinking how drab the colours would be come winter, but I think it would also work to make you think about planting something new in your garden. I appreciate that a little planning is required when it comes to having a range of coloured knitting wool at hand each day to create a Garden Blanket. You want the colours to compliment each other, maybe interpret it using shades of pastels for each days chosen colour. I can not promise that my aspirations will live up to the reality, and it maybe that I require a little help along the way, so knitting friends be warned and be armed with patience too. But I think I may have just talked myself into next years big crafting challenge to create a Garden Blanket. What do you think? Is it doable? 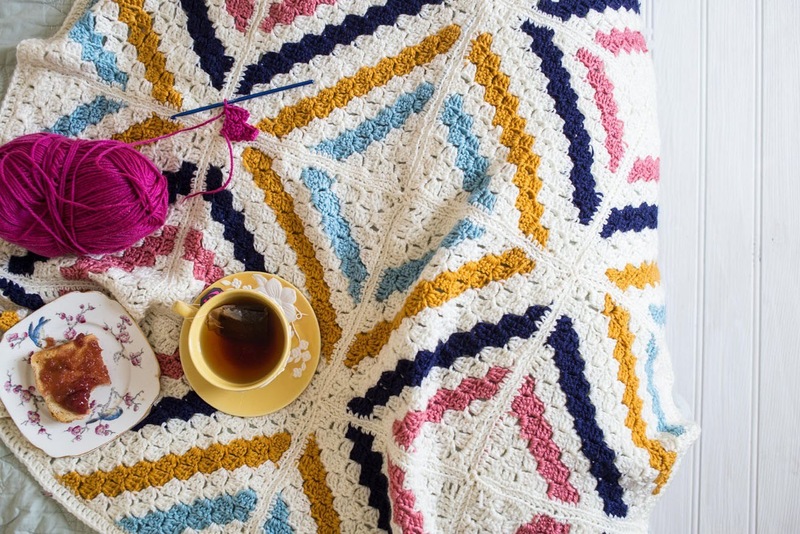 Or would I be better to chose a kit blanket, where all instructions and yarns are supplied like the gorgeous Cedar River Blanket in the top photo. Have you created a knitted or crocheted throw? Would love to hear any tips or ideas you have.